I know for myself that sometimes after a long day, once I get home the last thing I want to do is cook dinner. But ordering in or going out to eat can get expensive, and let’s be honest – it’s not very healthy. 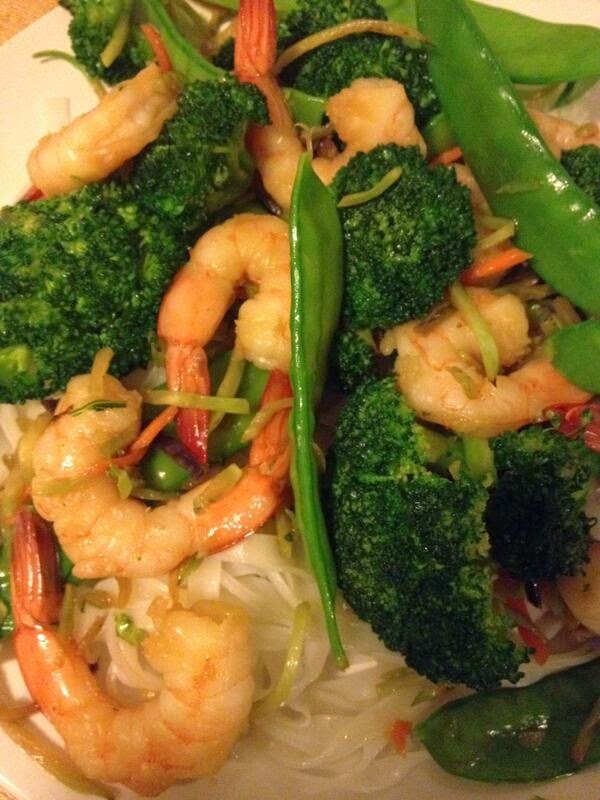 This shrimp and vegetable stir fry is so easy to make and takes practically no time at all! It’s full of vegetables and you get some protein from the shrimp as well. Full disclosure, I used frozen cooked shrimp when I made this dish. You can use cooked frozen, uncooked frozen or fresh. You could even use frozen vegetables in a pinch. The great thing about a stir fry is that you decide how much vegetables and protein you want! If you are using fresh vegetables, slice and chop them into even pieces. If you are using frozen vegetables, pre-cook them according to package directions, to the point where they are ALMOST done. If you are using frozen shrimp thaw them in a bowl of cold water. NOTE: Do NOT use warm water, or you will begin to cook the shrimp! Once they are soft to the touch, they are thawed and ready to be patted dry with paper towels. If you are using fresh uncooked shrimp, shell and devein the shrimp. Place the dry shrimp in a bowl, and coat with ¼ cup of the teriyaki marinade/sauce. Leave them to soak as you cook the vegetables in the stir fry. Slowly heat up a large wok. Full disclosure, I used a large skillet and it worked just fine! As the wok (or skillet) warms add the 1.5 - 2 tablespoons of canola oil. Once hot, add all the vegetables and stir fry until almost cooked through. Personally - I prefer my vegetables with a slight crunch. Add some of the teriyaki marinade/sauce to the vegetable, but beware – the store bought marinade/sauce is usually high in sodium, so easy does it! You can always add more, but you can’t take any away! Now, add your shrimp to the pan. Don’t add the excess teriyaki marinade/sauce that shrimp was soaking in, just disregard that sauce. If you’re using the pre cooked shrimp, you will want to add them when your vegetables are done. This shrimp is already cooked so you just want to heat them through and mix with the vegetables for flavour. Shrimp cook very quickly and get rubbery when over cooked, so be careful. If you’re using uncooked frozen shrimp or fresh uncooked shrimp, cook them with the vegetables for 2-4 minutes. When the shrimp becomes opaque, they’re done! You can serve this over rice or noodles, or even on its own. It’s a healthy, hearty meal on its own with all the vegetables, so go with your preference!